UDHAMPUR, APRIL 15:- District Election Officer, Dr. Piyush Singla today convened a meeting of Zonal and Sector magistrates at Conference Hall DC Office Complex Udhampur. Senior Superintendent of Police Rajiv Omparkash Pandey, Additional Deputy Commissioner, Gurvinderjeet Singh, AROs besides Zonal/Sector magistrates and sector officers’ duty officers were present in the meeting. DEO briefed the officers about their role and responsibilities during the elections process. He instructed them to follow instructions of ECI in letter and spirit. DEO further instructed AROs and duty magistrates to work in close coordination and update the District Election Authority about the latest positions on law & order, mock poll held and remain vigilant during election process. 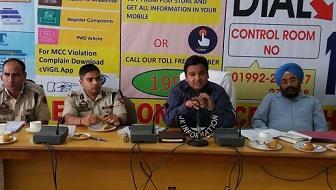 DEO also stressed upon timely update of issues if any and submission of desired information well in time.